Respond to our postings or tell us your body image stories. You are welcome to comment publicly on the site, or you can send a private message to us at wuafba@gmail.com. Experiment with this body acceptance process on your own by drawing yourself in the mirror, or photograph yourself using a digital camera. Trace silhouettes – draw or trace a photograph of yourself that you’ve then printed out in black and white on 8.5×11 paper, then colour or paint it, and write thoughts and feelings that come up while working with it. 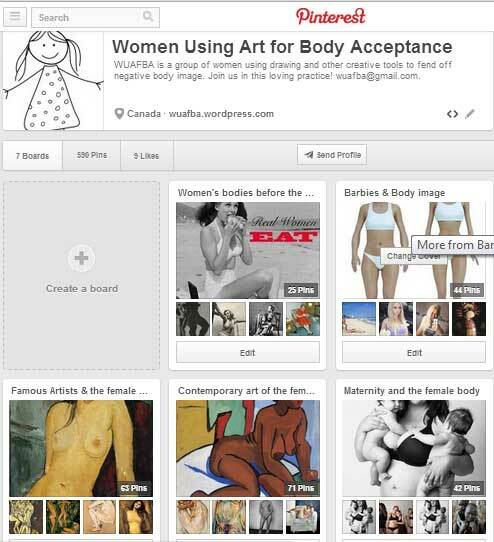 Check out our Pinterest Boards that are full of diverse bodies. Choose body shapes that are similar to yours, if you’d like, or chose others that for one reason or another speak to you. If drawing is not easy for you, send us a photo that we can transform into a silhouette (or body contour model) that you can use to draw yourself in the simplest way possible. Photos are seen only by the artist who accompanies you in this process – photos are never published or shared, only the artwork produced from them. Join the team by committing to draw yourself and others for the website and/or for the publication. Participants will be screened and chosen according to what we consider a sufficient level of respect and understanding for the proposed process and the ability to reflect positive feedback to those suffering from body image difficulties. We are all volunteers and invite you to give your time freely to this cause.